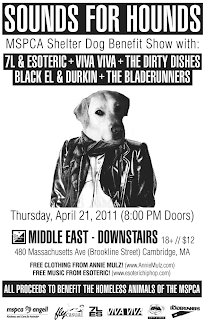 Tomorrow, Thursday April 21, at the Middle East Downstairs, we will be playing the MSPCA Shelter benefit show, Sounds For Hounds with 7L & Esoteric, The Dirty Dishes, Moe Pope w/ Quills, Black El & Durkin, and the Bladerunners. The MSPCA does a lot of amazing work for homeless and mistreated animals. When we got the call from Esoteric to join the bill, we immediately jumped on board. 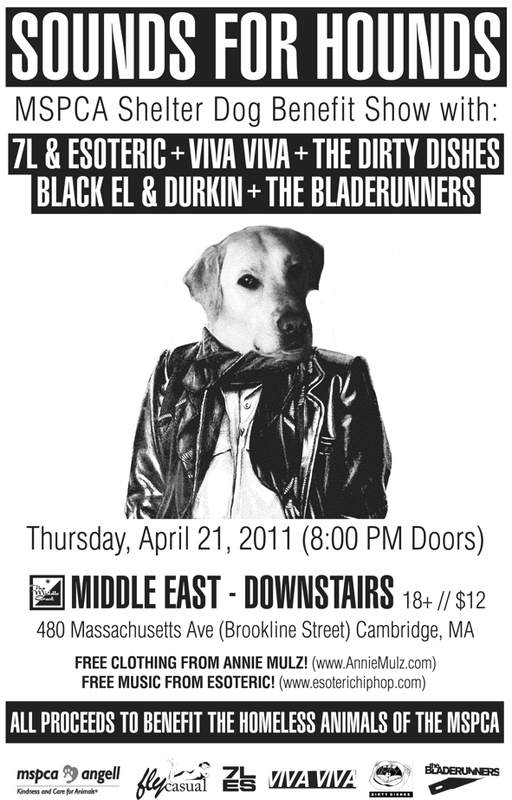 It is for a great cause and how could we pass up an opportunity to play with Boston hip-hop legends 7L & Esoteric! All proceeds from the show to benefit the homeless animals of the MSPCA. For more information, check out the facebook event page. The Boston Herald also wrote a great piece on the event. Tickets are $12 and are available at the box office or online. Also this Friday April 22, we will be playing at the MIT Senior House Steer Roast! We kick the party off early at 7:20. Also on the bill are Lespecial, The Streets on Fire, Math the Band and Japanther. It should be an epic week!